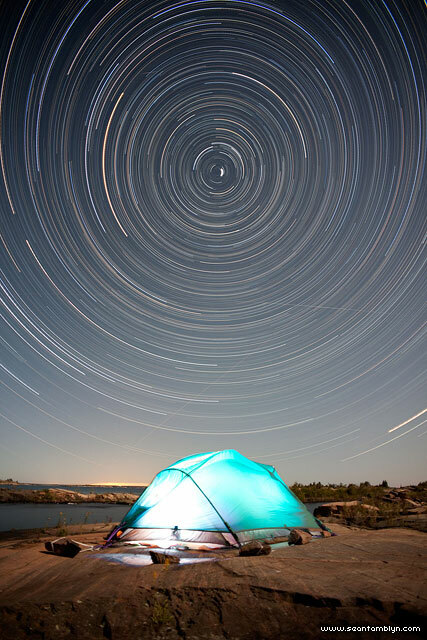 The starry night spins around Polaris, framing my temporary home while kayak touring Georgian Bay’s Churchill Islands. This entry was posted on Tuesday, January 24th, 2012 at 8:30 pm. It is filed under Areas, Star Trails and tagged with Canon EOS 5DmkII, Olympus OM Zuiko 21mm f/3.5, PClix LT. You can follow any responses to this entry through the RSS 2.0 feed.